PRO PLAYERS ASSOCIATION RADIO NETWORK presents "SPORTS IN PERSPECTIVE"
Organization of a new Sports Radio Station in the works for the Colorado market! "Sports in Perspective with the Pro Players Association. 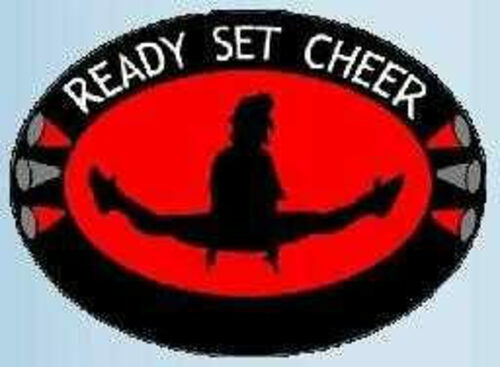 Sports, Entertainment and Media with a wink and a smile! From the professionals who played, performed, and the ones who covered it." Get your Sports in Perspective! Get your Sports in Perspective! Join members of the Pro Players Association when they give you their perspective. 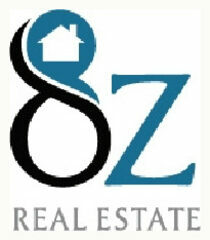 Sports, media, arts & entertainment from the professionals who played, reported, created and performed. PPA members represent a wide variety of current and former college, pro and Olympic athletes as well as members of the media, and entertainment industries. Our show hosts will interview special guests from time to time who will offer their perspective of the goings-on in their related world of expertise. During the NFL season “Sports in Perspective” presents the “NFL Pre-Game Show” . So listen-in Sunday to get your Sports in Perspective. WELCOME to our New Sponsors APEX Contracting LLC, Bridal Elegance & Gentlemen's Choice Formal Wear, and Brooklyn Veterinary Clinic. 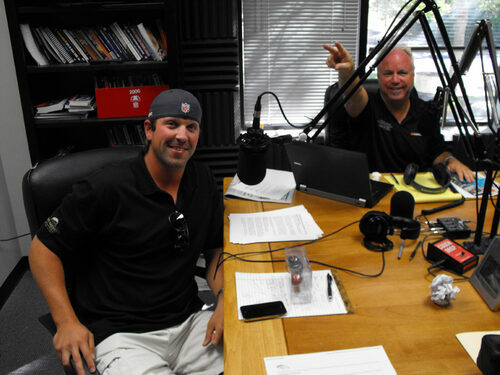 Sports in Perspective with the Pro Players Association welcomes Barry Helton to our team! Barry has also been a long-time member, supporter, and great friend of the Pro Players Association. To give everyone proper recognition, Barry Helton needed a third Super Bowl ring. As it was, he made due with the two he won playing with the San Francisco 49ers, one of the cherished pieces of jewelry coming his way in Super Bowl XXIV when San Francisco crushed the Broncos 55-10 on Jan. 28, 1990, at the Louisiana Superdome. Helton gave his first Super Bowl ring to his father, Perry Helton, in recognition of his father being his hero. Helton kept the second Super Bowl ring for himself, but his mother, Sharon, deserved co-ownership of the ring given her husband, if not a ring of her own. "My parents always were supportive of me in anything I wanted to do," Helton said, remembering back to his youth growing up on the family farm outside of the small town of Simla, about 50 miles northeast of Colorado Springs. At a key juncture in his life, his parents did more than just offer support. They helped him become a punter, and he parlayed his skill to All-American status twice at the University of Colorado, a place on the Big Eight Conference's all-decade team (1980-89) and to NFL championships with the 49ers in the 1988 and 1989 seasons. But there was a time when he wondered if he had a place on the football field. 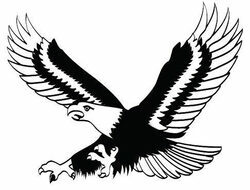 As the team's quarterback, Helton guided Simla to eight-man state football championships in three consecutive seasons, 1980-82. It was difficult for players from the eight-man division to gain attention from major colleges, but the staff at Colorado found out about him, and he was offered a scholarship to play for coach Bill McCartney. But in spring practice of his freshman year, McCartney decided to install the wishbone offense. That change didn't fit Helton's skill set. "I didn't think I was fast enough to play quarterback in the wishbone," Helton said. "I was used to the passing game, and passing isn't a major part of the wishbone offense." Helton went home for the summer determined to find a place on CU's team where he could excel. "I had to figure out a place to play," Helton said. "In all honesty, my mom and my dad helped me the most to try punting. I had done a little punting in high school, but never practiced it." Helton and his dad went to a one-day punting school at Oklahoma State University and then returned to the farm for advanced punting school. "We were out in the middle of nowhere on the ranch, and my mom and dad would go out with me every day to practice punting," Helton said. "My mom would throw the ball to me underhand, and my dad would watch my steps and time the hang time. My dad was my eyes, but they both taught me how to punt." For a long time, Helton wondered how he would have done as a college quarterback if McCartney hadn't changed offenses. He believes he would have been competitive. But there have been great rewards for his punting. He remembers the 20-10 victory over Nebraska in Boulder in 1986 as a highlight. "That was the most fun I ever had," Helton said. "I had a better game against Nebraska the year before, but when we won, the score was the most important statistic. We came close to going to the Orange Bowl, but we never could beat Oklahoma." With the 49ers, Helton was in the midst of a locker room of who's who of pro football. 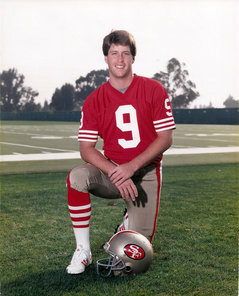 He played quarterback for the scout team and sat in on quarterback meetings with Joe Montana and Steve Young. Helton played four seasons for the 49ers and finished his football career in 1991 after a season with the Los Angeles Rams. After football, Helton returned to Colorado Springs, got his dealers' license and entered the car business. He is entering the Colorado Springs Sports Hall of Fame at an induction banquet Oct. 30. "Athletics sure were good to me," Helton said. "At one point of my life, that period was the high point. But as I've gotten older, I realize that was a small part of my life. I wouldn't trade what I have today." Even with his Super Bowl rings, Helton doesn't mind being called a small-town guy. "My values never changed," Helton said. "I learned that right was right and wrong was wrong. There was no gray area. It made things real simple." WARWICK BASHFORD, internationally recognized as one of the world’s most respected tennis coaches and as the "Tennis Mental Toughness Coach", he is acknowledged not only for his abilities as a tennis consultant, he is recognized as a visionary and a leader. He coached such greats as Amelie Mauresmo won two Grand Slam singles titles at the Australian Open and at Wimbledon, and also won a Silver Medal at the 2004 Summer Olympics and Michael Chang an American tennis player who became the youngest-ever male player to win a Grand Slam singles title when he won the French Open in 1989 at the age of 17. Warwick joined the Pro Players Association as an active member in 2013. 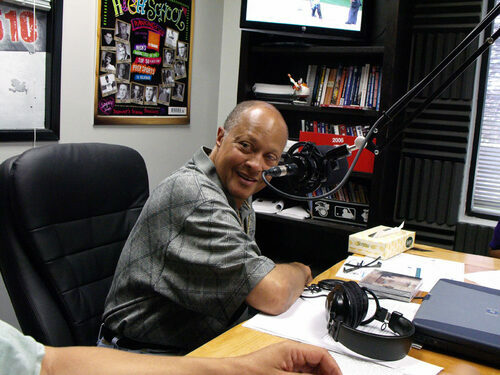 He appears regularly on PPA Radio Network's "Sports in Perspective", and presents a segment on tennis known as "Stringing Along with Warwick". 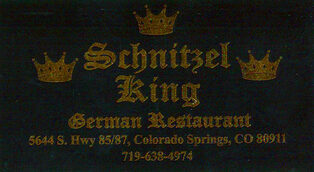 Originally from South Africa, Warwick resides in Colorado with his wife and daughter. As a part of his segment to "Sports in Perspective", Warwick inspires others to lead like a True Champion through his "Mental Toughness" training. 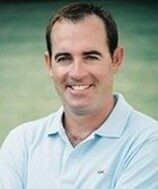 He shares the secrets to his success in life and business while overcoming overwhelming obstacles to achieve his dream to becoming a professional tennis player & coach. Through his real life experiences about being a professional tennis player and Wimbledon tennis coach, Warwick uses humor and vulnerability to share the lessons learned relating to today’s business and life. THE FOLLOWING INFORMATION IS HISTORY! 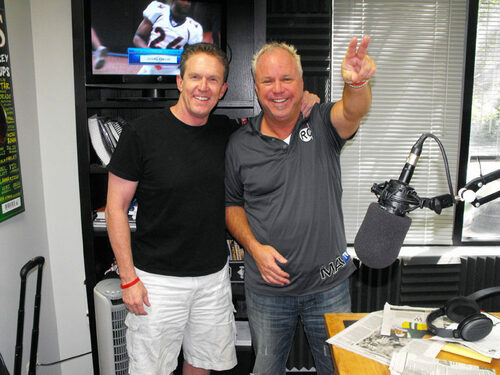 Mark McIntosh and Kurt Hansen kicked off the Inaugural "Sports in Perspective" Show. Bobby Pesavento debuts with Kurt Hansen at show #2, Sunday, September 21, 2010. 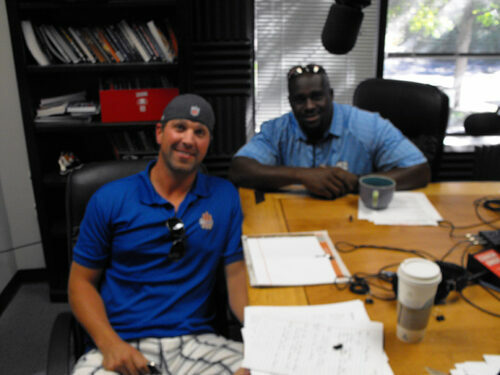 Co-Hosts Bobby Pesavento and Ebenezer Ekuban at show #3, Sunday, September 28, 2010. 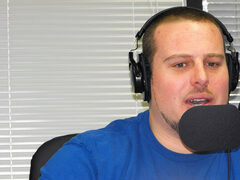 Matt McChesney's first day in the studio, January 16, interviewing former CU Buff and Carolina Panther Sean Tufts. 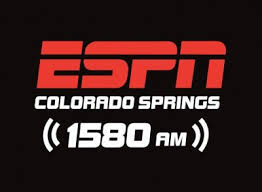 Fred McHenry, SIP's former co-host, was a veteran Denver sportscaster, having done a 2 year stint with Mile High's Gil "The Nooner" Whiteley back in the day. 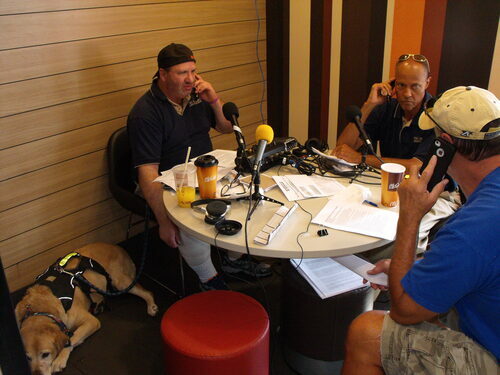 From left: Chris Bianchi, Engineer; Gary R. Adler, Producer/Director/Co-Host; Fred McHenry, Sports Commentator; Dave Studdard, Co-Host, former Denver Bronco.